Unable to breathe, patients entered iron lungs, which made use of negative pressure ventilation to compress and depress the chest, simulating respiration. In the early 20th century, polio was one of the most feared diseases in industrialized countries, paralysing hundreds of thousands of children every year. A highly infectious disease, polio attacks the nervous system and can lead to paralysis, disability and even death. The symptoms – pain and weakness, fatigue and muscle loss – can strike any time from 15 to 50 years after the initial disease. In 1952, more than 21,000 Americans contracted a paralyzing form of polio, and 3,000 died from it. Once infected, there was no treatment besides time and tending to the symptoms. 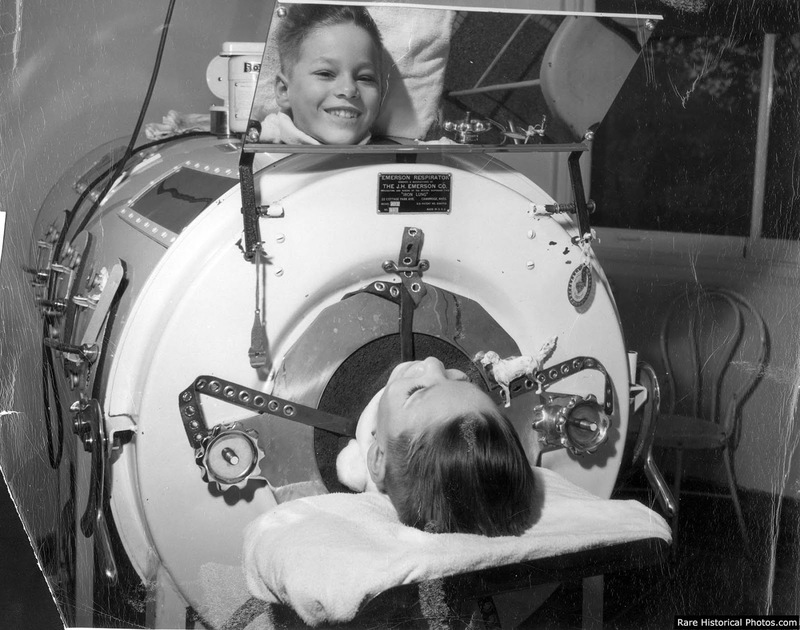 No device is more associated with polio than the tank respirator, better known as the iron lung. Before its invention, children with polio died frequently. Physicians who treated people in the acute, early stage of polio saw that many patients were unable to breathe when the virus’s action paralyzed muscle groups in the chest. 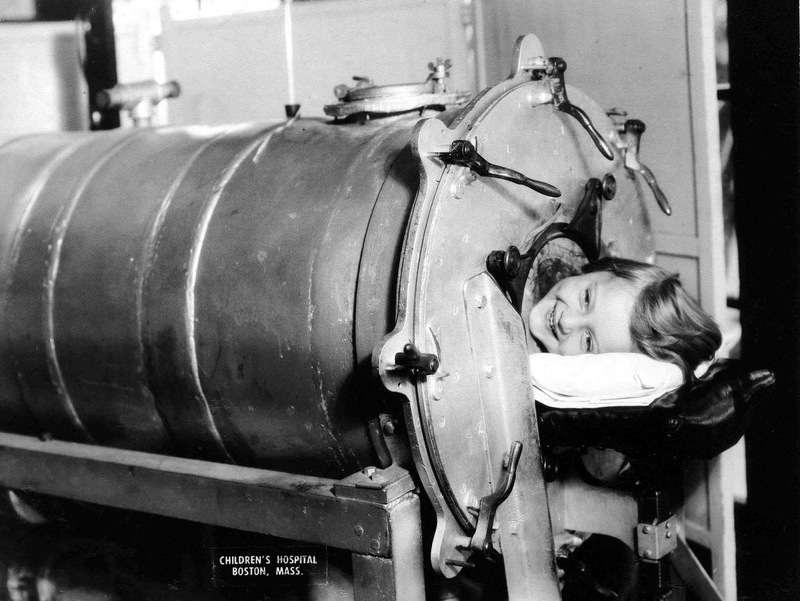 The first iron lung used in the treatment of polio victims was invented by Philip Drinker, Louis Agassiz Shaw, and James Wilson at Harvard, and tested October 12, 1928 at Children’s Hospital, Boston. The original Drinker iron lung was powered by an electric motor attached to two vacuum cleaners, and worked by changing the pressure inside the machine. When the pressure is lowered, the chest cavity expands, trying to fill this partial vacuum. When the pressure is raised the chest cavity contracts. This expansion and contraction mimics the physiology of normal breathing. Although the patient could breathe in the machine, he could do little else besides look up at a mirror reflecting the room behind him. Although the patient could breathe in the machine, he could do little else besides look up at a mirror reflecting the room behind him. 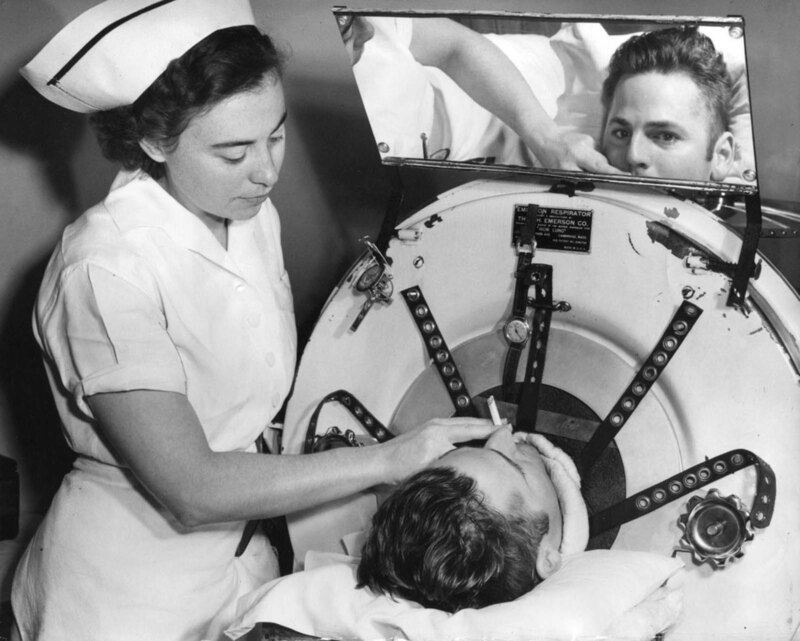 The design of the iron lung was subsequently improved by using a bellows attached directly to the machine, and John Haven Emerson modified the design to make production less expensive. 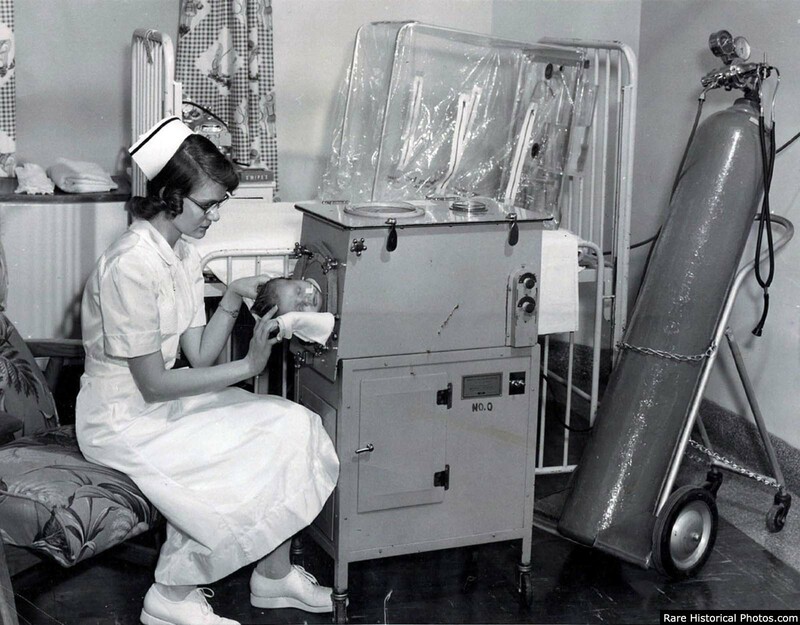 The Emerson Iron Lung was produced until 1970. Other respiratory aids, such as the “rocking bed” were used in patients with less critical breathing difficulties. 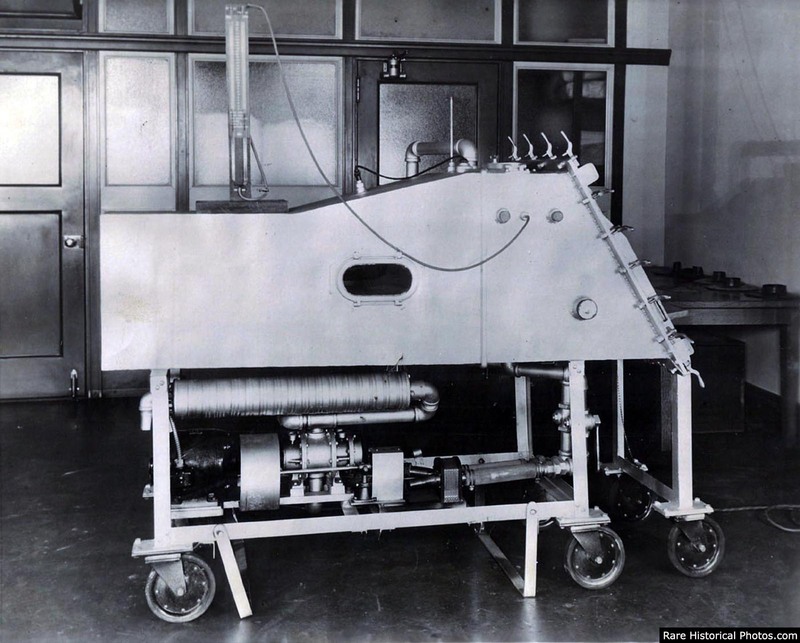 During the polio epidemics, the iron lung saved many thousands of lives, but the machine was large, cumbersome and very expensive: in the 1930s, an iron lung cost about $1,500—about the same price as the average home. 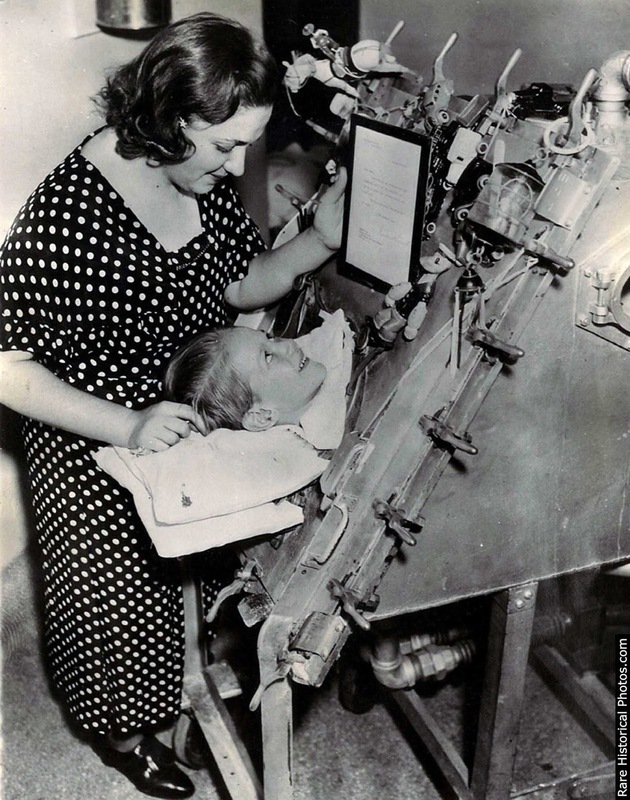 The cost of running the machine was also prohibitive, as patients were encased in the metal chambers for months, years and sometimes for life: even with an iron lung the fatality rate for patients with bulbar polio exceeded 90%. These drawbacks led to the development of more modern positive-pressure ventilators and the use of positive-pressure ventilation by tracheostomy. Positive pressure ventilators reduced mortality in bulbar patients from 90% to 20%. 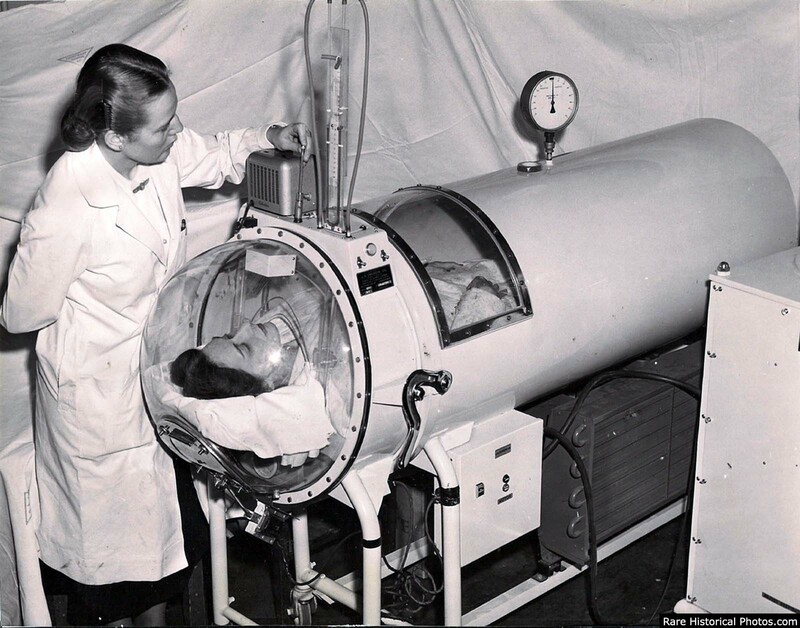 Late 1940s iron lung with dome. Verne Muskopf, a nurse at St. Anthony’s Hospital, South Grand Boulevard and Chippewa Street, helps iron-lung patient Louis Abercrombie smoke a cigarette in November 1949. Abercrombie was a polio patient and had been in an iron lung for almost three years. Hospital policies on smoking were different then. 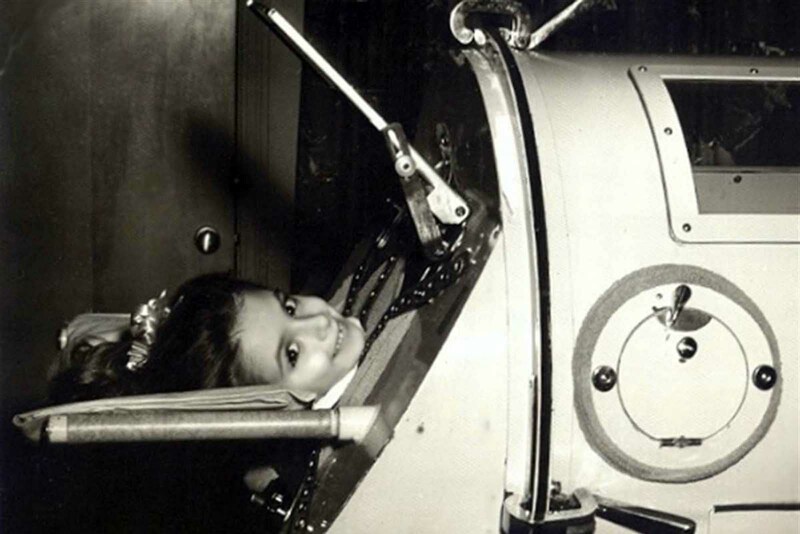 Betty Sue Martin, 5, can still smile after 35 days in an Iron Lung at Johns Hopkins Hospital. 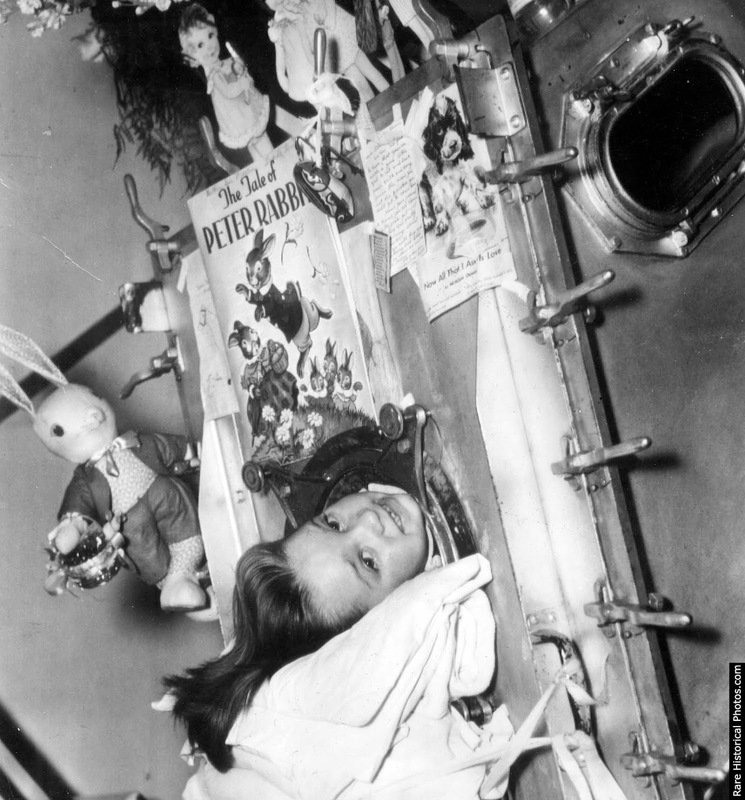 Martha Ann Lillard was just 5 in 1953 when she became paralyzed by polio and had to use an iron lung respirator. She spent six decades in the 800-pound device. Franklin D. Roosevelt contracted polio in 1921 at age 39. 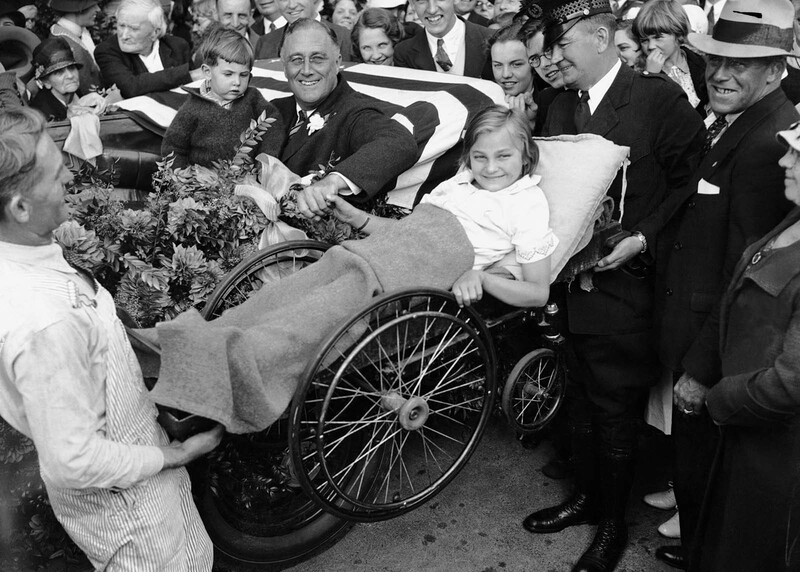 Here, two men lift a little girl in a wheelchair so that Roosevelt can greet her from his vehicle during his first presidential campaign. Two vaccines are used throughout the world to combat polio. 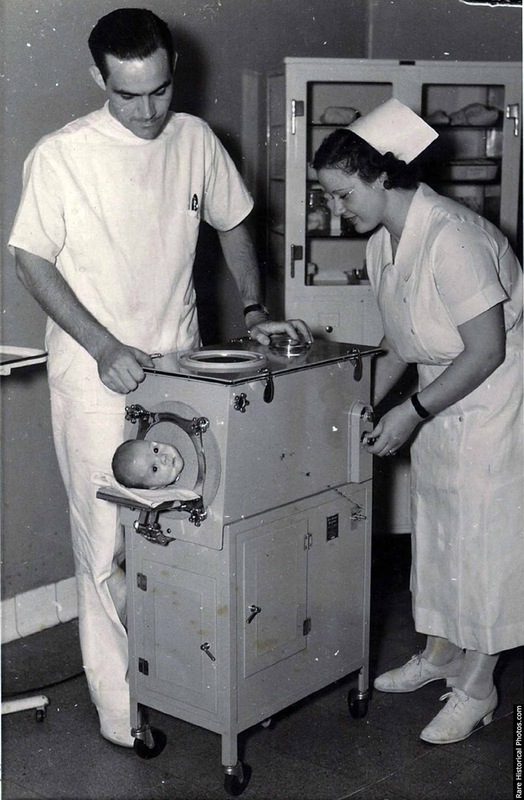 The first was developed by Jonas Salk, first tested in 1952, and announced to the world by Salk on April 12, 1955. The Salk vaccine, or inactivated poliovirus vaccine (IPV), consists of an injected dose of killed poliovirus. In 1954, the vaccine was tested for its ability to prevent polio; the field trials involving the Salk vaccine would grow to be the largest medical experiment in history. Immediately following licensing, vaccination campaigns were launched, by 1957, following mass immunizations promoted by the March of Dimes the annual number of polio cases in the United States would be dramatically reduced, from a peak of nearly 58,000 cases, to just 5,600 cases. Eight years after Salk’s success, Albert Sabin developed an oral polio vaccine (OPV) using live but weakened (attenuated) virus. Human trials of Sabin’s vaccine began in 1957 and it was licensed in 1962. Following the development of oral polio vaccine, a second wave of mass immunizations would lead to a further decline in the number of cases: by 1961, only 161 cases were recorded in the United States. The last cases of paralytic poliomyelitis caused by endemic transmission of poliovirus in the United States were in 1979, when an outbreak occurred among the Amish in several Midwestern states. (Photo credit: AP / Steve & Mary DeGenaro / Boston Children’s Hospital Archive / AARC’s Virtual Museum). Imagine spending years and years imprisoned in an Iron Lung!